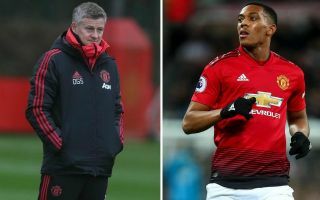 Manchester United star Anthony Martial has confirmed he and his team-mates would like Ole Gunnar Solskjaer to stay on as manager permanently. The France international, speaking at a press conference today alongside Solskjaer, praised the style of play the club have adopted under the Norwegian and aimed a dig at the tactics of his predecessor Jose Mourinho. Martial has been in superb form this term, particularly since Solskjaer replaced Mourinho, and it’s little surprise to see the 23-year-old admit he and others in the squad prefer the team’s more attack-minded approach now. MUFC have long had attacking traditions under the legendary Sir Alex Ferguson, but made a number of poor managerial appointments following his retirement. None of David Moyes, Louis van Gaal or Mourinho really bought into the club’s history in the same way as Solskjaer, who is a club legend from his time as a United player. It’s clear he’s now becoming an increasingly popular choice for next Man Utd manager, though he’s only currently in his role until the end of this season. Solskjaer himself has not given much away about his future, despite one report from the Sun stating a decision has been made to keep him on.